Eco-Tech is an award-winning Minnesota pest removal company. It has received Minnesota’s Division of Wild Animal Management’s ‘A’ rating and Angie’s List’s Super Service Award five times. Eco-Tech specializes in flea extermination for homeowners in the Bloomington, MN area. Fleas are more than annoyance to homeowners. They are hard to find and difficult to kill if you do not have the training and access to technology needed to do the job right. People who try rid their homes of fleas without professional help often meet with frustration and anger. 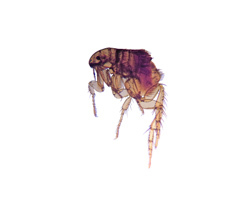 Fleas have a habit of persisting and being difficult to get rid of. Regardless of how pesky your home’s flea infestation may be, Eco-Tech has the professional skill and practical experience to get rid of them from your home permanently. If you wake up one morning and notice red spots on your skin, or if your pets are constantly itching, you may have a flea infestation. Contact Eco-Tech immediately instead of trying to solve the problem on your own. Unfortunately, if you do try to kill the fleas in your home on your own, the remedy you choose will cost you some money, and will likely not result in the desired end result you seek. In fact, you will likely have to contact a professional anyway. Eco-Tech will offer you competitive pricing and will take care of the flea infestation in a way that you simply cannot. Flea bites are itchy and uncomfortable, and fleas can carry disease. It is important to understand the necessity of thorough, professional tactics to remove fleas from your home. The importance of contacting Eco-Tech for flea infestation is huge. If you notice any signs of fleas in your carpet or other areas of your home, contact Eco-Tech fast. In addition to creating an uncomfortable nuisance, fleas multiply quickly and are very hard to kill. Once they are killed, Eco-Tech will ensure that your home is sanitized properly so that no disgusting flea carcasses remain. We will treat your home as well as your yard. Our treatments kill the fleas that are causing the problems and also prevent eggs from hatching. We use pest control solutions that are safe for your children and your pets. If you live in or near Bloomington, MN, and have a flea infestation in your home, contact Eco-Tech to address this problem at (763) 785-1414). The staff of Eco-Tech is professionally trained and has the tools and experience to remove your flea problem.